NEWS – Henry returned to action as a substitute driver for Mid-State of Ohio Kart Club Race No. 7 at Circleville Raceway Park a week ago Sunday. 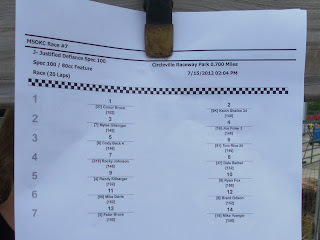 This event featured a combined, 20-lap feature race for the Spec 100 Pipe and 80 cc Shifter classes. One of the 80cc Shifter class drivers, who is quite a bit older than the rest, didn’t think he could do 20 laps at one time, so he asked Henry to fill in. That meant that all three Bruce brothers would be racing on the same track at the same time. PRACTICE – Laura and I had been in Colorado for some rest and relaxation (and some work for me) the week prior to Race No. 7, so most of the preparation was done the day before. Peter got a new exhaust header and another clutch tune up and Conor got new tires. We spent the majority of the practice sessions Sunday morning fine tuning Peter’s clutch. Both boys were relatively fast on their practice tires – so much so for Peter that he decided to use them for the race. After the conclusion of practice, the rain that had been predicted for the day came with a fury. It poured for about 15 minutes, which delayed the proceedings by about an hour and a half while the track was dried out. Conor and Henry did their part by taking turns doing laps in their 2000 Honda Civic Si (see video here) and Peter did laps in his girlfriend’s 2010 Volvo S40. SPEC 100 PIPE – For his first heat race, Peter started from the pole position. He made a good start and led through the first few corners. The second place kart got a better run through Turn 4 on the opening lap and was able to pass Peter going into Turn 5. While trying to re-pass the leader on Lap 5 (of six), Peter left the door open in Turn 4, lost another position, and finished third. Peter started and ran in fifth throughout most of his second heat race. He inherited a position when one of the other karts retired and finished fourth. A third and a fourth earned Peter the fourth-in-class starting position for the combined feature race. The lap times he was running made it obvious that the tweaking we had done to his clutch was obviously not working, so for the feature, we borrowed a clutch from a former competitor in this class. We also began to suspect that his engine was in need of a top end rebuild. 80cc SHIFTER – Conor started his first heat race from the seventh position (of nine). He gained a position at the start, another on Lap 2, and another on Lap 6 to finish fourth. Starting from third in his second heat race, Conor gained a position at the start, lost a position on Lap 3, but gained it back on Lap 5 to finished second. Fortunately, no one in this class did extremely well in both heat races, so a fourth and a second was good enough for pole position for the combined feature. The kart that Henry would take over for had finished ninth and eighth in the heat races, so Henry would start eighth in the combined feature. 80cc SHIFTER/SPEC 100 PIPE COMBINED FEATURE – With Conor starting on the pole, Henry in eighth, and Peter in 13th, things were shaping up for an interesting conclusion to the day. Shifter karts normally use a standing start, but for the combined feature, both classes used a rolling start with the Spec 100 Pipe karts lined up behind the 80cc Shifter karts. Conor got away well and led by about four kart lengths after Turn 4 on the first lap. Further back in the field, there was mayhem. One of the shifter karts towards the front spun exiting Turn 5. Another kart behind then spun in avoidance – right in front of Peter. Peter clobbered the wayward kart with his left front wheel, crumpling a nose and bending a steering spindle in the process. The race was red flagged so that the EMT could check out the driver of the kart that got clobbered and the broken karts could be cleared. This obviously ended Peter’s day and negated Conor’s great start. Henry had managed to get through the first lap unscathed. During the restart, Conor didn’t get away quite so well. The kart on the outside of the front row stayed with him through Turns 1 and 2, which put him on the inside for Turn 3. Conor had to concede the lead in Turn 3. While trying to regain the lead on the next lap, Conor left the door open in Turn 9 and dropped to third. The new second place kart made an aggressive move for the lead in Turn 4 on the following lap and both karts dropped two wheels into the grass at the exit. This left the door open for Conor, who made the pass for second and pulled alongside the leader going into Turn 5. Conor had the brake bias adjusted too far towards the rear and locked the brakes, which sent both spinning karts into the grass. Conor got a big boot from the nose of the third place kart, which bent his rear bumper into his rear wheel, bringing an end to his day. So, with both Peter and Conor out, where was Henry? In second! From the rear half of the grid, he had kept his nose clean through both starts and was chasing down the leader by the end of Lap 3. However, 20 laps is a long way to go in a shifter kart around CRP, particularly for someone who hasn't raced in over a year and Henry began to fade a bit by about mid-distance. The kart that had gone off with Conor had recovered and came through to pass Henry for second in the closing stages, but Henry hung on to record a podium finish in third. NEXT RACE – Henry, who has been home since his graduation from Brown University in late May, had an excellent return to action. He has since taken a job and moved to Boston. To say that he will be missed is an understatement. While Conor again had the speed to win, his streak of misfortunes continued. We’re hoping that Peter’s mediocre performance is the result of equipment problems. For MSOKC Race No. 8, which is Sunday, July 29, 2012 at CRP, Peter’s engine has been freshened up and we hope to have another clutch to try. Since Conor had an abbreviated feature race, his tires are still relatively fresh for Race No 8. After that, there is a short one-week break prior to our favorite event of the season, the Commercial Point Karting Classic (formerly the Commercial Point Grand Prix), which is August 4 and 5, 2012. p.s., Lap times, lap charts, and results from Race No. 7 can be found here. Our three-kart lineup for the combined 80cc/Spec 100 Pipe feature race, and the carnage that resulted (click to enlarge). 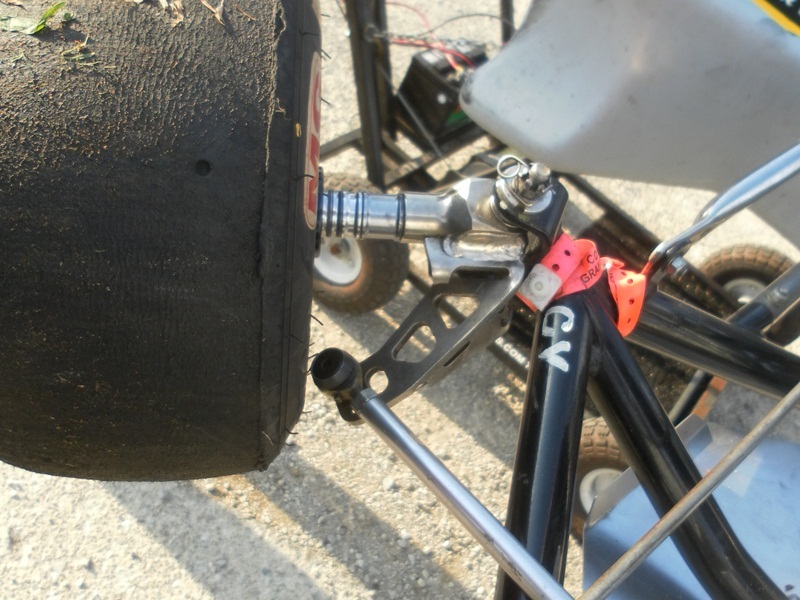 NEWS – Bruce Brothers Racing had an up and down day for Mid-State of Ohio Kart Club Race No. 6 at Circleville Raceway Park a week ago Sunday. Both Conor and Peter were looking forward to this reverse-direction (clockwise) event that featured timed qualifying, as both aspects tend to suit both boys well. The cooler was full of plenty of drinks to cope with the hot and humid conditions. PRACTICE – For Race No. 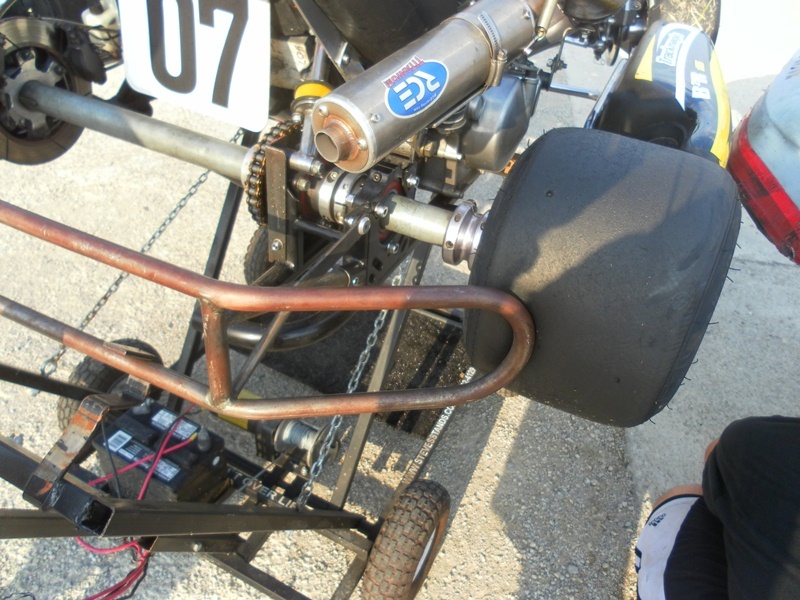 6, Peter’s kart got a clutch tune-up, a new exhaust mounting bracket (mounted to the chassis instead of the rear bumper), a gear change (to suit the clockwise direction), a new chain, and fresher tires. Conor and I spent a few hours the previous Sunday at Wilmington Raceway Park, which is a new asphalt road course that is within an hour's drive of Columbus. It was fun to try a new track, but it was a bit bumpy (see videos here and here). So bumpy in fact that he broke his seat and a radiator support, which were repaired for Race No. 6. Conor practiced on old tires and Peter practiced on his race tires. SPEC 100 PIPE – Peter qualified second out of the four karts in his class. We had done everything we could during practice to fine tune his clutch without having to take it apart again. We got it close and hoped that a bit of additional running would bring it into the sweet spot. That never happened, and as the result, he was a tick off of the pace all day. We decided that this was better than making a major change, which would have necessitated starting the fine tuning process all over again. Starting from second in his heat race, Peter timed the green flag perfectly and went around the outside of the pole sitter in the first turn (Turn 10 for reverse direction events). He pulled away a bit over the next few laps and then began to be reeled in by the pole sitter. Peter held on for the win by just over a second. There was drama at the finish, however. In the last turn of the last lap, Peter’s engine changed its tune dramatically. It turned out to be a broken exhaust header, which is usually grounds for disqualification. Since Peter could have coasted over the finish line for the win, no penalty was given. During the break, the header was replaced and the exhaust was remounted to the rear bumper. A second and a first earned Peter pole position for his feature. It was again the kart on the outside of the front row that had an advantage going into the first turn – but just barely. Peter didn’t concede the position easily, and the first two karts went side-by-side through the first three turns with the other two close behind. Peter eventually settled into the second position and stayed there until the checkered flag. 80cc SHIFTER – There were eight karts in Conor’s class. During qualifying, he could not quite match the time he had set during practice on very old tires, which had us scratching our heads, and qualified second. From the outside of the front row, Conor made a better start than the pole sitter and was into the lead at the exit of the first turn. He led the first lap but was then passed at the end of the long straightaway (Turn 4 for reverse direction events) on Lap 2. He couldn't quite match the pace of the leader and finished second. We made a few chassis adjustments during the break which we hoped would have the desired effect in the feature. From the second starting position, Conor again made a great start but had to settle for second in the first turn. Conor seemed to be a bit faster than the leader, but the leader would pull away down the back straightaway only to be reeled in by Conor during the remainder of the lap. I was certain that Conor would find an opening as the laps wore on, but sadly he did not get the chance. On Lap 5 (of 10), Conor pulled into the grass with an engine that had stopped running. It turned out to be the electrical connection from the ignition box to the coil, which had become disconnected. In reinstalling his seat after the repairs, I had routed the wire on the wrong side of the seat strut. Flexing of the chassis must have pulled it apart. One other kart had failed to make the starting grid, so Conor finished seventh. NEXT RACE – Peter was fortunate not to have been disqualified for his broken exhaust, but Conor was not so fortunate with his ignition box connection. We have quite a bit to do for Race No. 7, but extreme heat in Columbus has prevented this from happening. The weather in Columbus seems to have broken in past few days, but Laura and I are now in Colorado for some rest and relaxation followed by a conference later in the week for me. Race No. 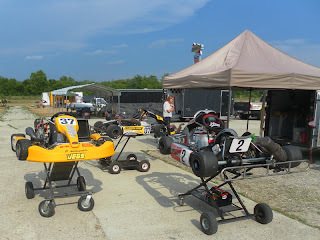 7, which is Sunday, July 15, 2012, will feature a combined, 20-lap feature race for the Spec 100 Pipe and 80 cc Shifter classes. I’m sure the boys are hoping that the weather in central Ohio stays mild. p.s., Lap times, lap charts, and results from Race No. 6 can be found here. The yellow buildings in the background are part of the former DHL hub there.